Apparently I wasn't joking about the end times. Earthquakes and now hurricanes? Jeez, it's like someone's out to get us. So what should do you? If you're in a roof or back yard, get your hives on to a wide stable base. I recommend wooden shipping pallets. They're free and widely available. Using ratchet straps, you can cinch down your hives and keep them from toppling. They're what I use in Fort Greene, and I am pretty confident in the safety of those hives. If you are worried, you can also weigh them down with cinder blocks. Hives cinched down tightly, around BOTH shipping pallets, and weighed down with planters. As you can see, I also moved them very close to the wall to help block the wind. As good as it's gonna get. 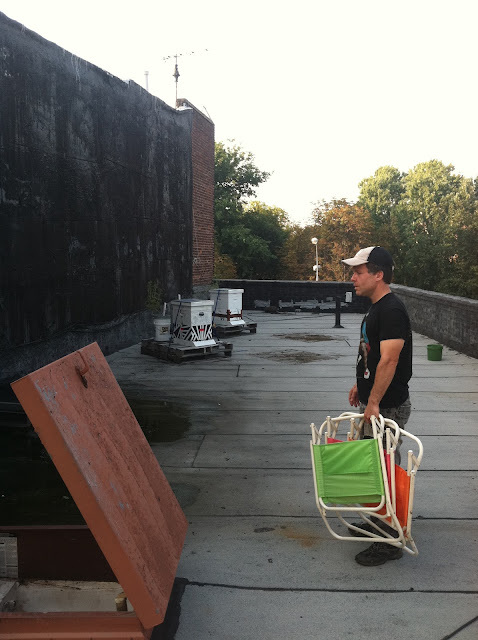 Chase Emmons, of the Brooklyn Grange, rescues my $10 lawn chairs. Unfortunately, I do not have the logistical capability to move the hives I maintain at the Added Value farm. Last year (before I managed them), the hives were destroyed in the tornado. This year, it'll probably be the hurricane. Because I couldn't move them to the Bronx, I did what I could to secure them in their current location. They're not going to get knocked over by the wind, but are still at risk of flooding. Cross your fingers, folks. 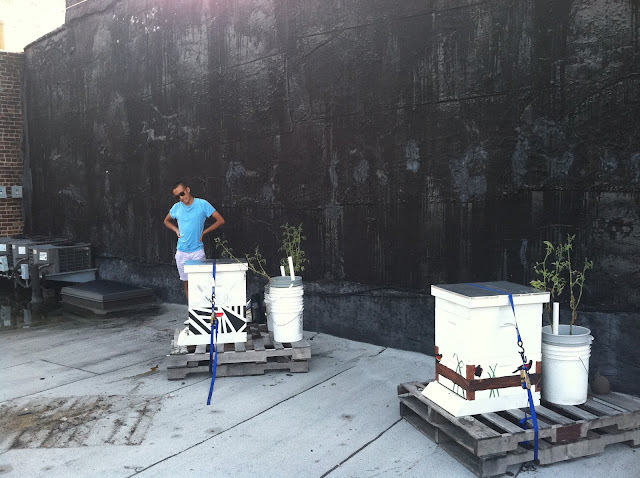 The hives were moved to a strong pallet set on cinder blocks and strapped down THROUGH the blocks using multiple ratchet straps. Thanks to Karl, Maris, and Anna, volunteers at Added Value who helped me lift and secure the hives and got soaked and filthy in the process. "While the forecast remains uncertain, there is a possibility New York City may experience hurricane or tropical storm conditions this weekend." Hives ratchet-strapped down TO something, such as a shipping pallet from a local grocery store, are less likely to tip over in high winds. Loop the strap completely around the hive, and completely under the pallet slats, so that one end of the strap is hooked to the other, then ratchet down very tight. IF YOU ARE IN AN EVACUATION ZONE PLEASE CALL THE BEE RESCUE HOTLINE: 917-740-4BEE (4233) ABOUT MOVING YOUR HIVE TEMPORARILY TO SAFER GROUND. We hope all will be well, but recommend taking precautions. 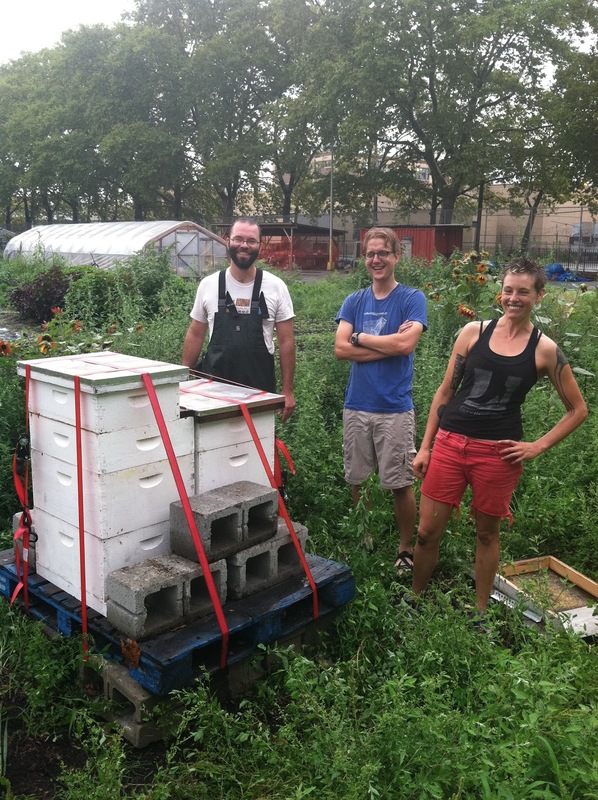 If you CAN get your hives to the Bronx, you should. As Jim mentions in the comment below, the site is very secure. It's just a matter of getting them there. The noblest sentiments of man. 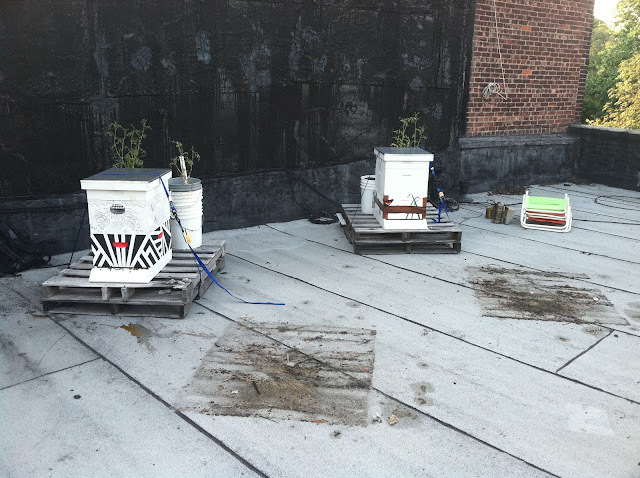 If you are hesitant about bringing a hive to the nycbeekeeping.org main rescue yard in the Bronx, the site as 24x7x365 security, running water, and very high fences. But if you still don't like the Bronx, we might be able to house refugee-bees at our secret locations in Mid-Town Manhattan, on Randall's Island, and in Eastern Queens or Red Hook, the last two locations not recommended given the projected storm paths. But yeah ratchet straps are your friend. Oh, the Humanité: Mosquito Spraying Continues. Mosquito Spraying: Sign of the Rapture? More Mosquito Spraying! OH BOY!